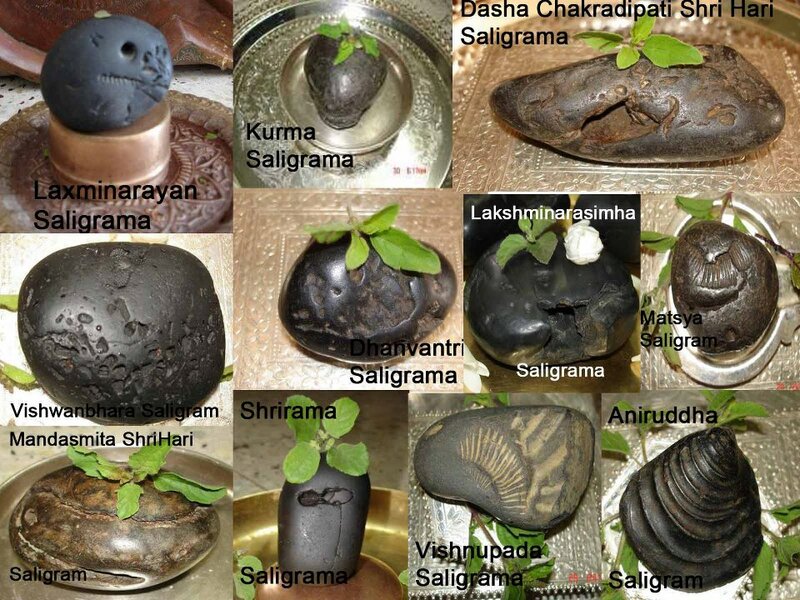 Sai In My Breath: Salagrama Stones. Why are these stones called Salagrama? How to Identify the divine Salagrama? That is due to a story in the Varaha Purana 144 -145, which says that once there was a sage by the name Shalankayana, who was performing austerities and devotional meditation in many holy places with the view to gain a great devotee of Lord Vihsnu as his son. He visited the sacred tirtha (holy place) of Muktinatha in present day Northern Nepal, high in the Himalayas, and took his bath in the icy waters of the Kali Gantaki at the back of Annapurna mountain. Extremely tired from his climb in the high altitude, he finally took rest under a sala tree. The geographic location of the Annapurna (Shaligram Tirtha) region. Fast asleep on the eastern side of the tree, he didn't notice that the Lord Krishna had come and stood before him. Then by the Lord's mercy the sage awoke and saw his Lord standing there and immediately propitiated him with melodious Vedic mantras. 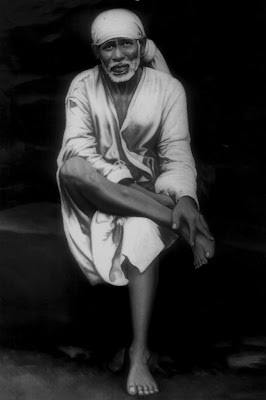 The Lord then fulfilled the desire of the sage and gave him a son on the spot, and being pleased with his devotional attitude, gave another boon. 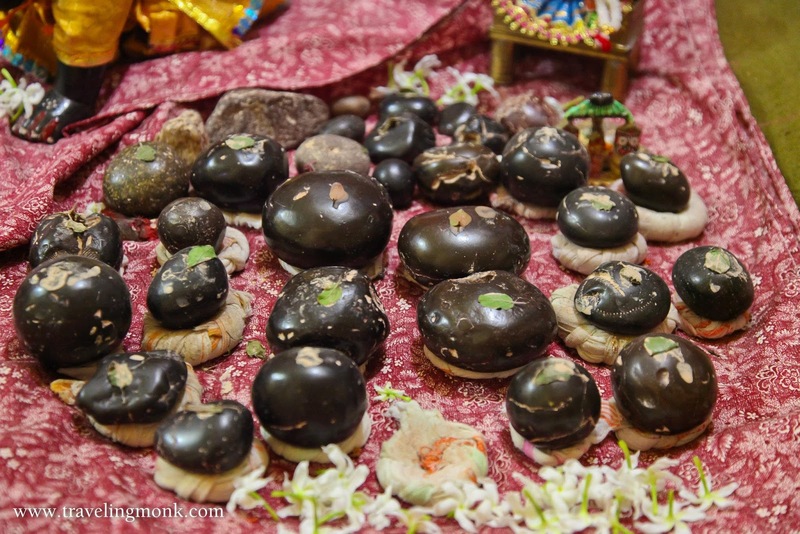 Krishna informed that from that day (the dwadasi in the sukla paksa of the month of Vaisaka) He would eternally stay on the area of that mountain in the form of the Salagrama stone. Actually there was no sala tree there at that time - it was a special self-manifesting mercy incarnation of the Lord appearing for His devotee. So in the same way, the Lord continued to tell the sage that in the self-manifesting form of the Salagrama - Shila He will reside there, and the devotees can take Him in this form and worship Him, and He will reciprocate their love in that way. This is confirmed in the Mahabharata (Vana Parva Ch 84, 123-125), where it is said the name Salagram is given to Lord Vishnu who resides in the Salagrama at the Salagram Tirtha. The details to be examined are the shape and the colour of the stone, the number and location of chakra-marks, the type of filaments that are present in the crevices and fissures and the deity-identity. Of the large number of deity - specific salagrama - stones, three are held especially sacred: Vishnu - salagrama (identified by the chakra in the shape of a garland, and by the marks of conch, mace and lotus), Lakshmi - Narasimha - salagrama (having two chakras on the left side of the opening or vadana, and dots and specks all over the body), Matsya - Murti - salagrama (fish shaped flat stone with a single opening and two chakras, one of them inside the opening and the other outside; having dots and specks on the body resembling a foot-print). A salagrama with no openings but having two chakras on the surface is usually considered ferocious (ugra), and is either avoided or worshipped especially elaborately. The Matsya Murti salagrama is particularly recommended when it has a chakra on the tail portion (viz. Rear). Authorities like Vrddha - Gautama indicate that brahmanas may worship five Salagramas, kshatriyas eight, vaishyas seven and shudras seven; for ascetics four Salagramas are suggested.